Does anyone know why a genesis 3 figure imported into Blender causes the figure rotation to go all weird? I have blender set up nicely so I can rotate anything I want easily and intuitively. Once I import an .obj of a genesis 3 figure though, the rotation becomes not just counterintuitive and contrary and incredibly frustratingly difficult. So much so that I want to scream. If there's a solution, I'd love to know. I assume you chose Blender in the "To" drop down box right? If you haven't already, click "Show additional options"
Now when you open it up in blender the rotation should be back to normal. Just remember to repeat the above mentioned steps when you import it back into Daz. 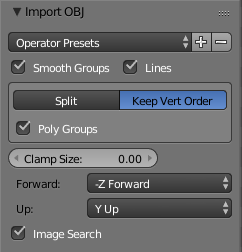 You can save a new preset in the OBJ export dialogue, rather than making changes each time. It still won't work and the figure is broken into segments - torso, chest, etc.......not a unified figure that I can work with. Also, even though I assigned the axes as advised, it still didn't translate and the whole pivot thing is hideous. What settings are you using? It sounds as if Blender is splitting the mesh by groups. Under WRITE GROUPS, the Use Node Name(s) is checked. Under WRITE surfaces, Original Maps is checked. By the way, I appreciate the fact that you've taken time on this so thanks to both of you. I don't usually work with figures, but can't you just B to box select all the parts, and then Ctrl +J to join them? Ok, item one, I usually use the Daz Studio scaling preset or the Poser one x10, and just change the grid size in Blender, because the Blender export to obj preset is broken as regards rotation and they've never fixed it. Item two, more importantly, you need to check "keep vertex order" in Blender's obj import settings. It's "split" by default. Thanks guys. I'll give those things a try and let you know how it went. But first, sleep. Time zone thingy, you know? Just in case you don't know, Rufus, Sickleyield is a very well-respected member of the 3D community, a content creator here at the DAZ store and elsewhere and has been using Blender in her content-creation pipeline for a long time. If anybody knows how to work between Blender and DAZ Studio, its her. She's a very nice person, too, BTW. I didn't know this could be done. Is it in the user prefs? Lol slow up there. I use a lot of programs, Blender's just the first. Even after years I know I'll never be an expert. But thank you for the nice things anyway. ;) @3WComics, Hit N. A panel should pop into view from the right. Scrolling down shows you many display settings but the grid controls are near the mid/bottom. I use blender from time to time. My setup is I choose the default Daz Studio export preset. And do the right settings within the blender import options. I have made a screenshot for you fellows trying to import obj files from DS into blender. Even if it looks like the Operator Pesets cant be saved you have to check these options everytime you open up blender. Orignaly posted here: Morph Loader Pro doesn't morph to a shrinkwrap effect??? I make most of my own content in Blender and have a tutorial in PDF format you might find helpful. Comments, critiques and raspberries are welcome.